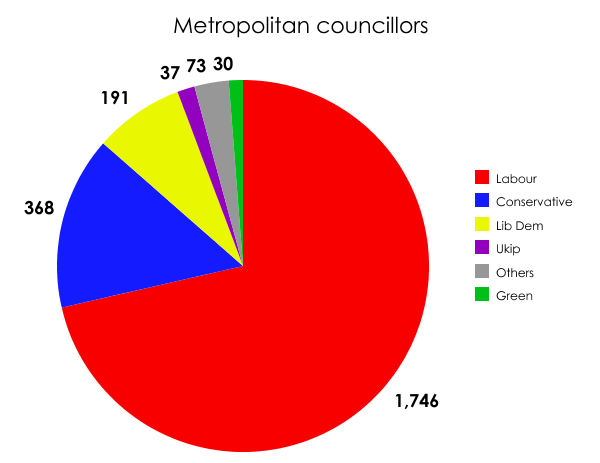 Earlier this month I wondered whether it was wise of Ukip to make such a great play of defining itself against so-called “metropolitan types”, seeing as how many seats in the local elections were on metropolitan councils. Ukip’s total of 37 represents 1.5% of the 2,445 seats that make up England’s metropolitan councils. Yes, the party won votes in all the 36 boroughs, but only enough to translate into seats on 13 of them. In most instances Ukip managed just one or two gains per council. Its biggest achievements were in Rotherham (10 seats) and Dudley (9). And yes, overall this is an advance on where the party was before the elections, when it held just five of those 2,445 seats. But it is definitely not an earthquake, juggernaut, revolution or any other of the words that have been used in the last 24 hours by a slightly-hysterical media (let alone that most ubiquitous term of all, a “surge”). I can’t help but wonder how Ukip may have fared had it not set out to characterise itself apart from and in opposition to one of the largest constituencies of voters taking part in this week’s elections. Then again, maybe such an approach is simply part of Ukip’s attitude towards politics in general and not a calculated campaign strategy – in which case there was nothing they could do about it. That’s barely any change on how things looked before. 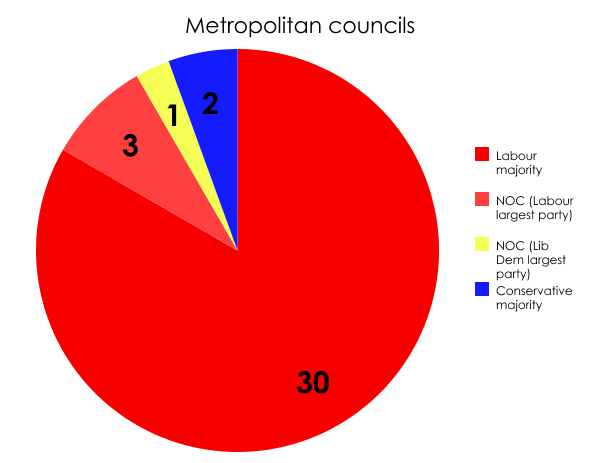 The only difference is in the number of councils in no overall control (NOC) with Labour as the largest party, which has decreased from four to three. This is due to Labour winning control in Bradford. The party had hoped for more, however, and had been expected to turn all four of those minority councils into majorities, as well as winning control of Trafford, one of the two Tory metropolitan boroughs. But that hasn’t happened. More on this tomorrow. Labour’s top 20 targets: how did it do?